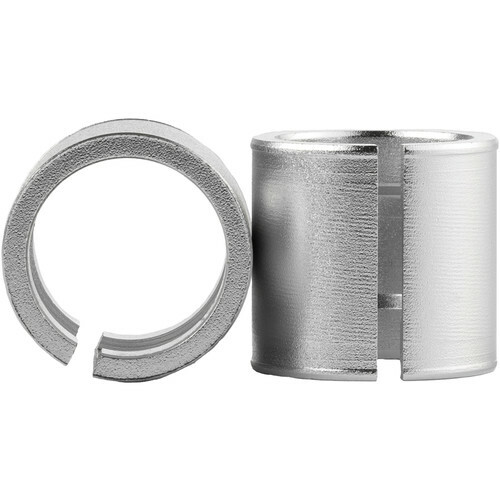 This 19 to 15mm Rod Adapter Bushing from Ikan fits into the 19mm rod bracket for PD Movie motors, enabling you to mount the motor on a 15mm support rod. The bushing is split, allowing it to compress, so it is easier to fit into the 19mm opening. The bushing's textured finish improves grip, and a contoured lip holds the bushing in place inside the rod clamp when not mounted on a rod. Box Dimensions (LxWxH) 5.0 x 2.5 x 0.1"
19 to 15mm Rod Adapter Bushing (PD Movie) is rated 3.0 out of 5 by 1. Rated 3 out of 5 by Santiago C. from ikan 19 to 15mm Rod Adapter Bushing (PD Movie) Very usefull for camera asisstants. There are some Arri or Ikan, more expensive but you can notice better construct on them.